Sunday brings out plenty of Championship finals and New Jersey added FOUR National Championship performances. Check out our highlights below. Mario Heslop completed an amazing weekend! 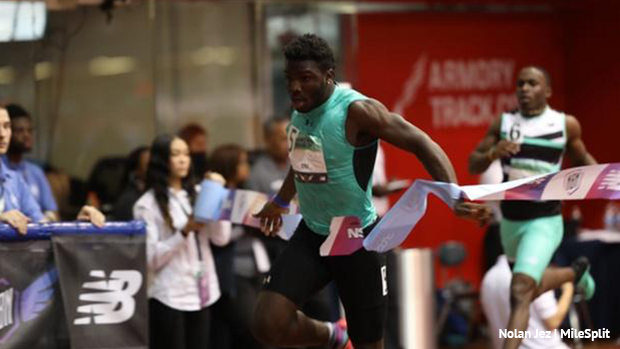 He first earned All-American status in the 60m dash when he finished third at 6.73. But then came back and won the 200m Championship with a monster state record and US#4 all-time 20.90! This was after tying the 60m dash state record in prelims on Saturday running 6.70. Devin Hart gets his National Championship in the 2 mile run with a hard fought run of 8:56.89! After retaking the lead from a talented Ryan Oosting, Hart then had to hold him off in a fiery kick to the line. Oosting was second at 8:57.37. Hart dropped a 28.62 last lap to bring it home! This moves him up to second all-time in New Jersey 2 mile history including 3200m conversions. Sincere Rhea closed out an amazing season in the hurdles winning the 60m hurdle championship with a 7.69, just .06 off the state record held by Cory Poole! 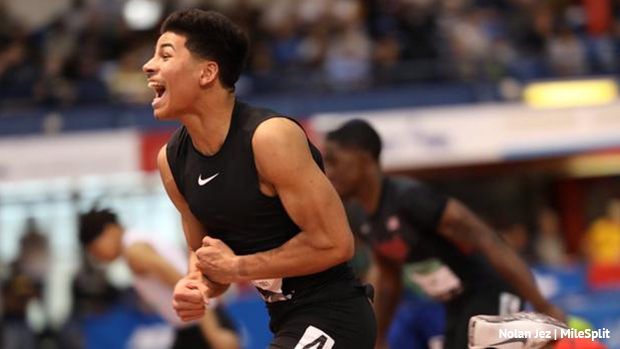 His 55m en route time was a 7.16 which improves his NJ top five all-time ranking. After multiple All-American performances this weekend St. Benedict's Prep finally felt that Championship feeling with a 3:18.36 win in the 4x400m. Their squad was made up of Lewis Ngwenya, 49.34, Jackson Burnett, 50.411, Alfred Chawonza, 49.58, and Isaiah Sanchez, 49.03. Matawan also scored an All-American finish in fifth at 3:21.88, Dylan LoPresti, Charlie Serrano, Justin Sumner, and Zachary Hall. Westfield and Elizabeth were ninth and 10th running 3:22.18 and 3:22.64. Randolph's Abby Loveys moved up to No. 3 all-time in NJ with a 10:21.00 in the girls 2 mile championship! She finished sixth overall claiming All-American status. Julia Trethaway of West Morris Central won the second to last heat with a 10:25.63, she finished just outside All-American in ninth. Nicole Vanasse 13th overall at 10:32.77 after leading the first heat. Athing Mu and Victoria Vanriele finish second and fifth in the 800m as All-Americans. Coming in as the defending champion Athing Mu split a 59.5 the first 400m before coming back for a 2:05.85, just as they were closing to the line freshman Roisin Willis made it past her for the win at 2:05.70. Mu's stated in the post-race interview she's still incredibly happy with this junior season, coming off an American record in the 600m and moving up the all-time high school list in multiple events. Victoria Vanriele who won the NJSIAA Meet of Champs in the event, was coming off a 55.61 400m prelim race this weekend, took fifth running 2:07.24. Luis Peralta of Passaic ran second in the boys 800m championship with a 1:52.30, his second straight All-American performance indoors. Alfred Chawonza, who had a very busy weekend on relays for St. Benedict's Prep, scored another All-American medal in sixth running 1:53.50. A solid end to a successful relay weekend for the Union Catholic girls, they finished fifth as All-Americans in the 4x400m running 3:47.31. Khamil Evans 58.35, Chidumga Nkulume 55.33, Sydney Tucker 58.02, and Leena Morant 55.61. Woodbridge 10th at 3:55.09. In the boys 4x200m championship St. Peter's Prep secured the final All-American spot in sixth running 1:29.76! Richard Luzzi-Liggins 22.91, Gus Nations 21.92, Ayir Asante 22.21, Joseph Morrone 22.71. Atlantic City's Claudine Smith goes 40-01.5 for fifth and All-American in the triple jump! She hit the mark twice, on her first and fifth attempt. That if also fifth all-time in state history for indoors in this event. Caroline Dannenbaum just misses All-American status in eighth on attempts, she cleared 12-10.25. She is now fourth all-time in state indoor history! Grace O'Shea of Ramapo finished 13th in the 60m hurdle prelims running 8.57. 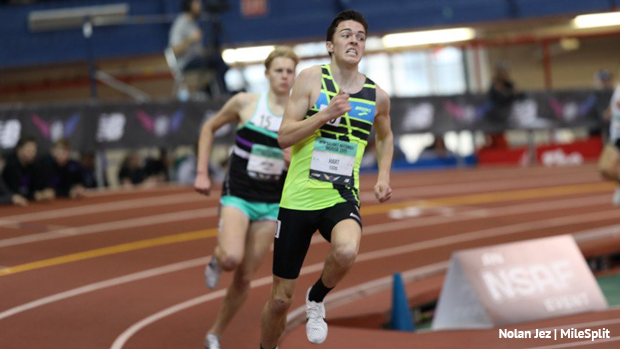 Jack Stanley led NJ in the mile championship with a 13th place 4:15.32 out of heat 1. New Jersey went 1-2-3 in the freshmen boys mile! Marco Langon of Bridgewater-Raritan won with a time of 4:26.72. Myles Plummer of Union Catholic second, 4:27.25, Kyle Rakitis of Kingsway third, 4:28.65, Jackson Barna of Ridge fifth, 4:29.24, and Jack Moran of Wall seventh, 4:30.17. Caroline Mehlhorn of Montgomery crossed the freshmen girls mile line in fifth at 5:06.43. In the boys junior high school mile Drayton Kolaras of Hillsborough, NJ ran for sixth at 4:48.74. Kayce Darby of Teaneck finished sixth in the girls 60m dash finals running 7.73. In the boys final we saw Geraldo Gibson of East Orange in sixth as well, 7.19.